This post has been nearly a year in the making. Hot oil treatments were very popular years ago and it seems as if they've come back in full force as a leave-in treatment! Over the past few years, nearly every hair care brand has come out with their version of a deep moisturizing hair oil and I've collected quite a few to review on this blog. Every brand pretty much has their own description of what their product does or what it's for, but essentially, these are all types of moisturizing treatments for your hair. For each product, I've listed the main oil ingredients, as well as ingredients that may be of importance to some people. Of course, they contain many other ingredients as well, and a full list can be found on the product's website. My hair is mid-length, straight and fine. My roots are oily in the morning and my ends are dry in the winter. How to use: "Apply a small amount of styling cream to damp or dry hair and style as usual." Result: Applying to damp hair leaves ends soft and moisturized. Applying to dry hair can make hair greasy, but in small amounts can moisturize very dry hair. Has a sweet, fruity scent. 60 mL / 2 f. oz. How to use: "Work a small amount through towel-dried, clear hair. Do not rinse. Perfect for every day use." Result: Applying to damp hair leaves ends soft and texturized. Applying to dry hair can give the same result if used sparingly. Has a sweet scent. How to use: "For styling and finishing, work a small amount into damp or dry hair. For extra nourishment, add a small amount to masque or leave-in cream." Result: I have to be careful with this oil because if I use a little too much, it makes my hair greasy. Applying the smallest amount to damp hair can leave a wonderful result, but applying it to dry hair leaves a greasy feel. Has a very slight soap scent. How to use: "Apply 1-3 drops (depending on hair length and thickness) to damp or dry hair and distribute evenly from roots to ends. Do not rinse out. Style as usual." Result: This doesn't leave my hair feeling greasy at all, but I don't think it really moisturizes my hair. While it's in my hair, it feels soft, but that softness is gone after I wash my hair. Has a sweet, fruity scent. How to use: "Massage Organix Macadamia Oil Dry Styling Oil between palms of hands and apply to clean, damp hair. Style as desired. Can also be applied to dry hair to moisturize split ends and tame fly-a-ways. Do not rinse." Result: I'm not a fan of this oil. Applying it to both damp and dry hair in very small amounts makes my hair greasy. Instead, I use it as a deep oil treatments, applying it to most of my hair and leaving it in for 20 minutes or longer. Has a slight fruity scent. 100mL / 3. fl. oz. How to use: "Apply a small amount of Organix Moroccan Argan Oil Penetrating Oil to palm, rub hands together, then apply evenly to surface of damp (towel-dried) hair working through to ends." Result: This is one of the better Moroccan/Argan Oils that I've tried. It doesn't leave my hair feeling greasy and it does a great job of moisturizing my ends. Has a slightly sweet floral scent. How to use: "Apply a small amount to wet hair ad distribute evenly. Style as usual. To control frizz, put a few drops in palm and smooth over hair as needed." Result: This is one of my favourites so far, and I've only tried it a few times. It doesn't leave my hair feeling greasy and it definitely leaves my hair soft and smooth. It also does not contain any type of silicones (dimethicone, for example) as almost all of these other hair products do. Has a slight 'perfumey' scent. 18mL / 5/8 fl. oz. How to use: "Can be used on both wet and dry hair to create a silky, smooth finish. Apply a coin-sized amount evenly throughout hair, avoiding the root area. Style as desired." Result: Another greasy product for me, however, I've only tried it once or twice. My main issue with this product is the packaging. While I love the price and size, the dispensing part is difficult to work with. There's just a tiny cap on top that pops off, but is difficult to remove. If not careful, it can easily drop out of your hands and make a mess. How to use: "Apply a small amount to wet hair and distribute evenly. Style as usual. To control frizz, put a few drops in palm and smooth over hair as needed." Result: I found this at Shoppers Drug Mart in the clearance section so I'm not sure if it's still available. Regardless, it is actually not a bad product and will moisturize your hair temporarily. However, I do not think it deep moisturizes as my hair is dry after washing it out. Has a slightly vanilla scent. A daily moisturizer for the face, skin, hair, nails and cuticles. How to use: "Daily facial and body moisturizer. Hair treatment. Nail and cuticle treatment." Result: This is 100% Argan oil. If you really want the full benefits or moroccan/argan oil, this is the one to get! This is great if you have an allergy or sensitivity to other ingredients. Although it has a bit of a tangy scent to it, I feel confident using it on my skin and hair because it's a natural and pure product. This is best used as a treatment (leaving it in overnight or for a few minutes, then washing it out) because it's a pure oil and will make your hair greasy. Skin absorbs this product well if applied thinly. How to use: "Apply to damp or dry hair and style as usual." How to use: "Composed of 50% genuine Monoï of Tahiti, this rich and scented oil is a pure beauty product for the summer.Ideal for darker skin or those accustomed to the sun, it can be used before and after sun exposure. Applied to the hair, it energizes and brightens hair highlights. It nourishes, giving your skin a marvellous glow, and helps your tan look deeper and more radiant." Result: This is a multi-use product. When used on my hair, it moisturizes well, even once washed out. On the skin, it leaves a greasy feel but this is all right if applied at night. Strong floral scent. As you can see in the photo, this oil turns solid in colder conditions. How to use: "Dispense a small amount of Organix Pomegranate Anti-Frizz Serum into palm, rub hands together, and then apply evenly to surface of hair. Apply to damp (towel-dried) or dry hair. Work through hair to end. Let dry naturally, or blow dry for all day style." Result: This is a great product for controlling frizz. It works best on damp hair and has a great pomegranate scent. Dimethicone, Cyclomethicone and any ingredient ending in "icone" or containing "silo" is often the first ingredient. I think these are what make the oils less greasy in hair. When a product has more than two of these, it seems as if it makes it more greasy! Macadamia oil seems to be the most moisturizing. Argan oil (in its pure form) can be used on the skin and cuticles as well. Better quality oils and treatments cost a little bit more. All of these are best used on damp hair. If it doesn't work as suggested, it can be used instead as a deep conditioning treatment. Have you tried any of these products? Are you interested in trying any of the ones I have reviewed? Hi! Argan oil is my favorite in the whole world! I can't live without it. Thanks for this! 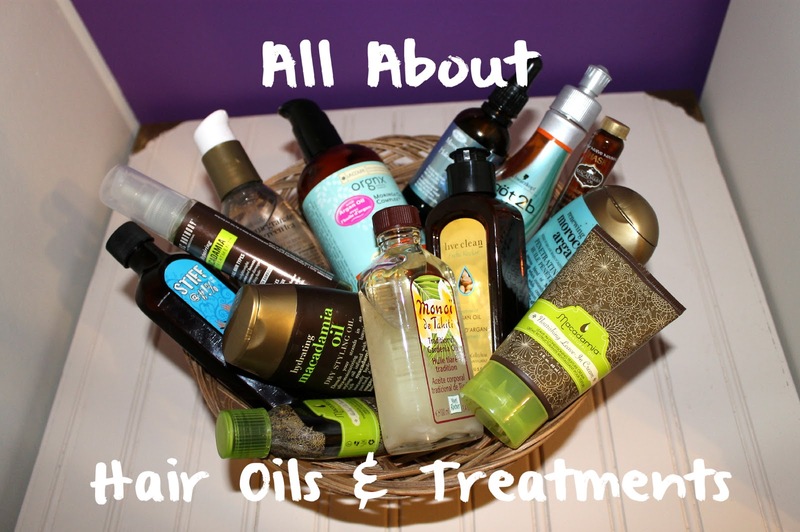 What is your best argan oil product? Thanks!